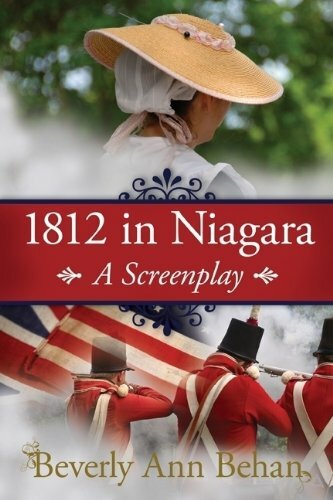 "1812 in Niagara: A Screenplay" tells the story of the War of 1812 from the Canadian side of the border in a way that's fast-paced, exciting and romantic. This is not a sleepy history book - created for the 200th Anniversary of the War of 1812, it brings this fascinating period of history to life with great characters and a story full of intrigue and lost love - told in an enjoyable format that enables readers to immediately visualize it as a movie. Our cast of characters includes: The beautiful and determined Laura Secord, who saves her rugged husband James by searching for him as he lies wounded on the battlefield at Queenston Heights, then saves her country by an intrepid journey to warn a British commander of an American plot; Tecumseh, the muscled Shawnee Chief - a fearsome warrior one day, an eloquent statesman the next (the sexiest man alive - in 1812); Isaac Brock, the princely British General, whose brother's bankruptcy in London prevents him from marrying the woman of his dreams, elegant Lady Sophia Shaw. And Captain Swayze - whose ghost still haunts the Angel Inn in Niagara-on-the-Lake. Is it 100% historically accurate? No way! Is it fast-paced, exciting and a great read for the 200th Anniversary of the War of 1812? You bet! Should it be made into a movie? You tell us! Readers can provide their comments - and casting choices - on our interactive website.